This is a picture I took a couple of summers ago. 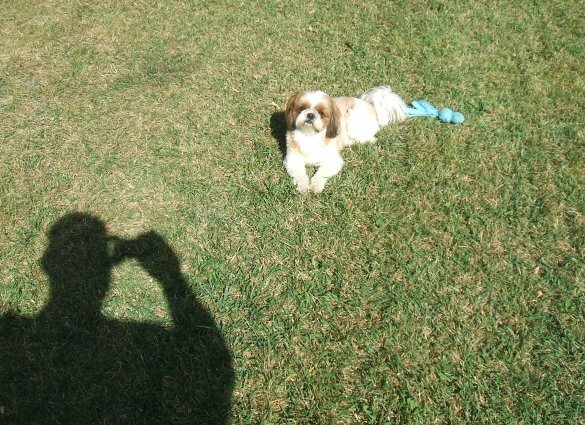 It’s me taking a picture of my husband taking a picture of our Shih Tzu, Ling Ling. Ling Ling is looking up at him and saying, “What are you DOING, Daddy?” If it hadn’t been so hot (somewhere in the 90s), she would have gotten up and investigated. "What are you DOING, Daddy?" The only fantasy story I can think of is perhaps the world is being invaded by shadow people. People think they are evil and try to destroy them, but the animals know and are okay with them…universally. Can you think of a fantasy story stimulated by this picture? This entry was posted in Featured Photography and tagged pet photo, postaweek2011, Shih Tzu, weekly photo challenge curiosity. Bookmark the permalink. Ha ha, I never thought of that. I think our dogs are used to it by now…they are so darned cute, we take lots of pics of them. The dog in the photo is our first little love, Ling Ling. I took a look at your name and started to laugh, because our nickname for Ling Ling is Princess. She is indeed of the royal purple born. You know those plaques and photo holders that say, “I’m not spoiled; I’m a princess”? Well, she fits that category with every inch of her royal hairy little body. Although we call her Pretty Princess (alas, yes, we pander to her vanity), she is indeed a hairy princess. And, apart from her vanity, she is the most loving, loyal, enthusiastic, comical (unintentionally, of course – princesses don’t clown around) little dog you would ever want to see. Perhaps you and she are spiritual twins. I intend to go back and read your story when I have some time. Thanks for stopping by and leaving a comment. I have a Shih Tzu too! They are total divas! She won’t walk in puddles or mud. The reason I chose my nickname is because it is what my Dad used to call me on account of my waist-length hair and the fact that I was his little princess! Pingback: Weekly Photo Challenge: Home | Wizards and Ogres and Elves…oh my!